The GoPro HERO5 Black features improved image quality, a more powerful processor, and faster frame rates. A compact yet versatile 2-in, 2-out USB audio interface. It gives singer songwriters two natural-sounding Scarlett mic preamps and the same class-leading sound quality and digital conversion as the rest of the latest Scarlett range. 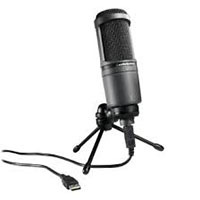 Take it anywhere, connect by USB, plug your mics and guitars straight in, and simply start recording. The Joby Gorillapod SLR-Zoom is an ultra-versatile mini-tripod or grip that can be used with large SLR cameras with zoom lens attached or with camcorders (max. load capacity of 6.6 lb/3 kg). Its three multi-segmented flexible legs can be formed to grip almost any protrusion, be it a branch, doorknob, rock, or uneven surface. The Photek TRI-X-2500 Tripod Extender adds a horizontal lateral arm to any standard tripod that has a 1/4"-20 or 3/8" mounting stud. It features a ball head with a quick-release plate. The Extender has a telescopic design and an overall length of 32". The 0.3-2.55 density can easily be controlled by rotating the front filter ring, allowing you to slow your shutter speed or work with a wider aperture setting than normally required. By offering the ability to adjust different density values, this filter can effectively be used in a wide range of situations and controlled to meet your exposure needs. Sketch, paint, design, and edit with a pressure-sensitive pen on the Wacom Intuos Art Pen & Touch Medium Tablet. Create with a natural line in paint, pastels, ink, charcoal, and more. The EF-S 55-250mm f/4-5.6 IS II Lens from Canon is a compact and lightweight telephoto zoom lens that is specifically designed for EOS DSLR cameras. A sleek wide-angle prime designed for Canon EF-mount DSLRs, the YN 35mm f/2 Lens from Yongnuo pairs the popular 35mm focal length with a bright f/2 maximum aperture to suit working in a variety of situations. 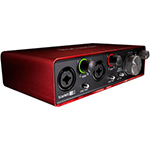 Focusrite's second-generation Scarlett 18i8 is a table-top audio interface designed specifically for use with a computer. The device sports four microphone inputs, plus four additional analog line level inputs. It has outputs for monitor speakers and two pairs of headphones. And it connects to a computer via USB 2.0. The Shure Model Beta 87A is a premium quality supercardioid hand-held electret condenser vocal microphone with exceptionally smooth frequency response and high sound pressure level (SPL) capability. Used for professional sound reinforcement, broadcasting, and studio recording applications, the Beta 87A combines superb performance with the ruggedness needed for touring and field production. The latest edition of the legendary AT4033 microphone, the side-address AT4033a offers low-noise, symmetrical, transformerless circuitry that results in exceptional transient response and clean output signals. A studio classic and bluegrass favorite, the AT4033 cardioid studio condenser is the microphone that broke the US$1000-barrier in its class. The Zoom F4 MultiTrack Field Recorder has 6 mic inputs and allows for the recording of up to 8 tracks. Battery-powered and portable, you can take the Zoom F4 into the field to record. The Zoom H3 VR Microphone records 360-audio environments to SD card, and can be used to create 360 video or VR experiences. Portable and lightweight, the Zoom H3 VR can be attached at multiple angles. Records natural 360° still images and videos with high resolution and highly precise stitch image processing. Produces incredibly realistic spherical video by shooting video in 4K (3840 x 1920, 29.97fps). A portable recording device and a 2-channel USB interface in one palm-sized unit, the H4n Pro Handy Recorder from Zoom features a built-in stereo microphone, two low-noise preamps with combination XLR / 1/4" inputs, multiple recording modes, on-board effects, a built-in metronome, a chromatic tuner, and more. As such, it's suitable not only for film- audio capture, podcasting, and field interviews, but for the creation and editing of multitracked audio in conjunction with DAWs. 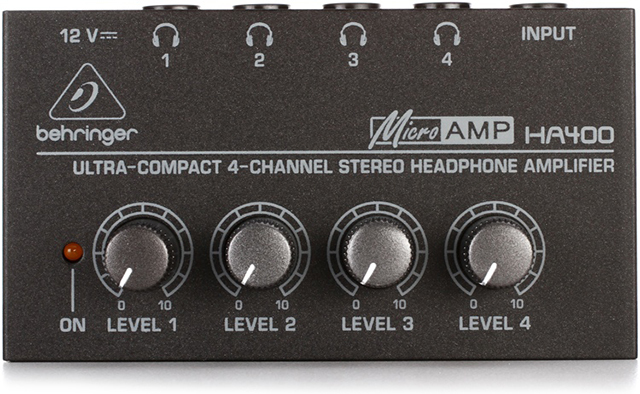 The ultra-compact Behringer MicroAMP HA400 is used to split audio between headphones. Simply plug in your stereo or mono mix and then connect up to four headphones, each with their own volume controls.